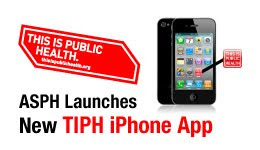 Home » TIPH » "This is Public Health" is now an iPhone Application! "This is Public Health" is now an iPhone Application! The "This is Public Health" campaign was first piloted during the 2008 National Public Health Week. Increase awareness about public health and the important role public health plays in our daily lives. Position Schools of Public Health as innovative/effective leaders in public health outreach and education. Engage new audiences, including policymakers and funders, in a dialogue about the importance of supporting public health. Attract and inspire the next generation of public health professionals through non-traditional engagement tools. The campaign uses stickers with the slogan "This is Public Health" placed in locations around the world to help reach its goals. The majority of participants [32.7%] learned about the campaign through the ASPH website. Educating the general public about public health, increasing awareness about careers in public health and increasing the understanding of the work of a particular institution were the top three goals of those who executed the campaign locally. When asked to rate on a scale of 1-10 how effective the “This Is Public Health” materials were in achieving their campaign goals, nearly a quarter [23.8%] gave the materials a 10, citing them as “very helpful” and over three-quarters of the respondents rated the effectiveness a 7 or higher. Simplicity and ease of use were what most campaign participants liked best about the “This Is Public Health” campaign. Nearly all respondents [92.1%] said that they were likely to recommend the campaign to colleagues in the public health community with almost 70% saying they were “very likely” to do so. Interestingly, some areas of mixed review were around the program's website, flickr group (pictures), and interactive google maps. There was some concern that keeping all the program materials online because it excluded those without Internet access. In addition, the adoption of flickr and maps depended on the "tech savviness" of the participants. So seeing that their newest addition is an iPhone application, it will be interesting to see which groups of participants are the earliest adopters of the technology. I look forward to seeing the next evaluation report! Related Posts : "This is Public Health" is now an iPhone Application!